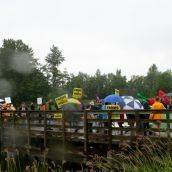 The unrelenting rain yesterday afternoon didn’t prevent people from participating in a lively rally and march against port expansion in the village of Ladner. 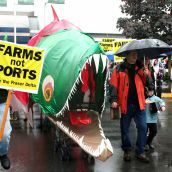 More than 150 people of all ages took to the streets with picket signs, noisy kitchenware, and the Island’s famous giant salmon puppet. 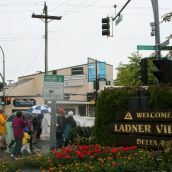 Organized by the local Delta/Richmond chapter of the Council of Canadians and other area residents, the demonstration was billed as the biggest street protest in Ladner’s history. 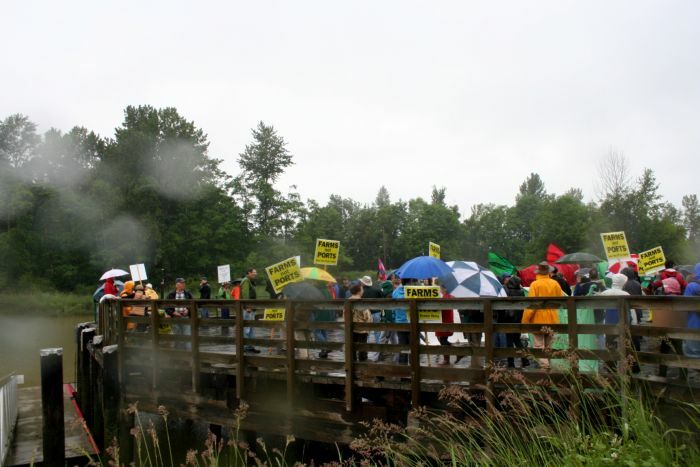 In fact, no one seemed to be able to recall any previous community protest march in the historic fishing village of 20,000 in South Delta. “Are we going to walk in the street? 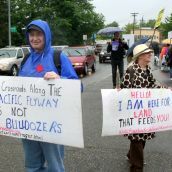 !” one local resident asked another with surprise when the group first left Magee Park and stepped off the sidewalk, blocking traffic. 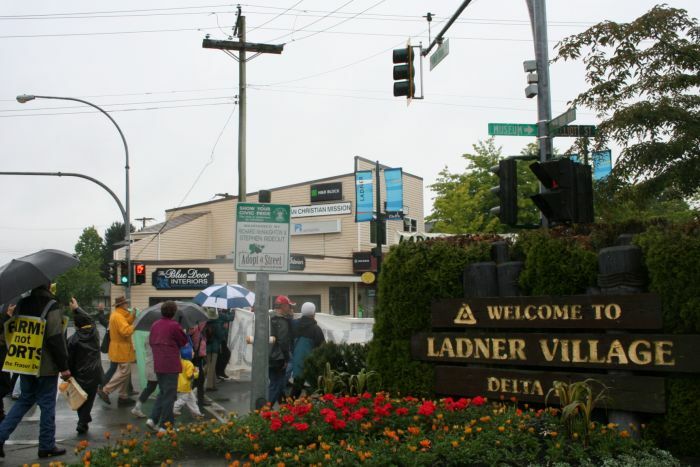 Before people from Ladner, Delta, Richmond, Vancouver and beyond wound their way through the historic downtown area, they gathered in the park to listen to a number of speakers. 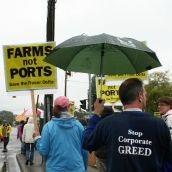 Growing opposition to the further industrialization of the port at Robert’s Bank and nearby farmlands stems from a range of concerns and ongoing struggles. 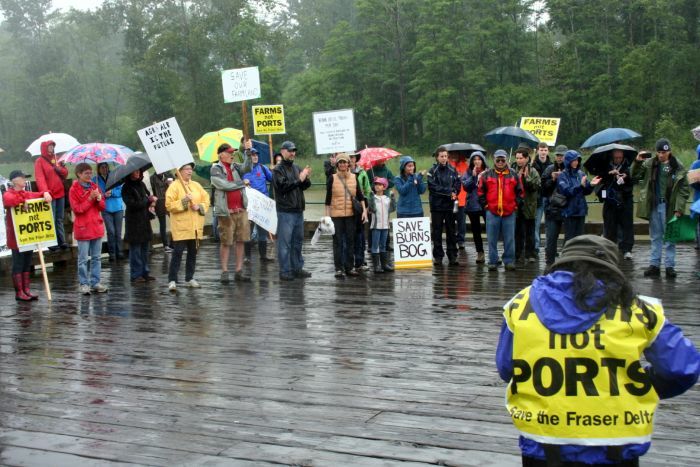 But the movement against the port’s expansion, which has been proposed several times over the decades since its construction, is not only about the port itself. A variety of industrial projects are in the works for vast tracts of farmland in the vicinity, including a Foreign Trade Zone. A Foreign Trade Zone (FTZ) or Free Trade Zone would create a corporate-governed area exempt from many laws and taxes, explained Council of Canadians BC Regional Organizer Harjap Grewal. Citing examples from China, India, Jamaica and Dubai, the proposed FTZ is part of a “complete corporate takeover of this area,” said Grewal. 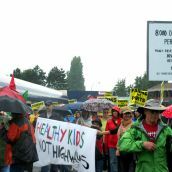 It also allows the City of Vancouver to brand itself as “green” while pushing industrial development to outlying cities like Langley and Delta, he said. 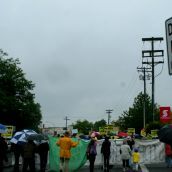 Grewal and others urged people to act beyond petitions and letters, to organize, and to raise their voices and issues in the streets. 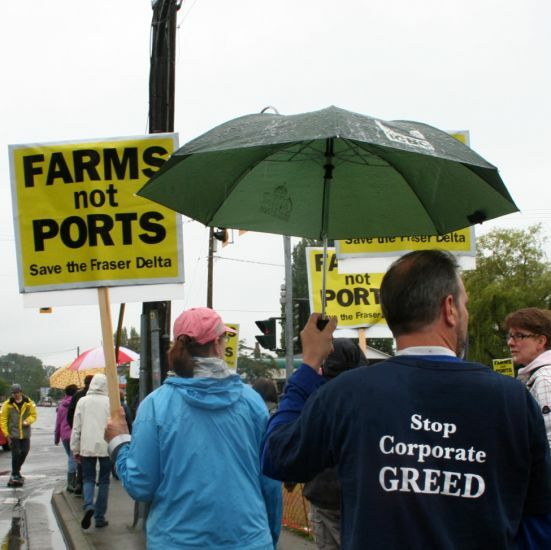 The FTZ, railyard expansion, warehousing facilities and other proposed port-related projects are located on farmland. 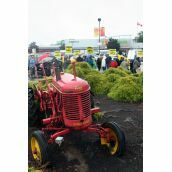 Much of it is part of the Agricultural Land Reserve (ALR) that area residents fought for and won in the 1973. 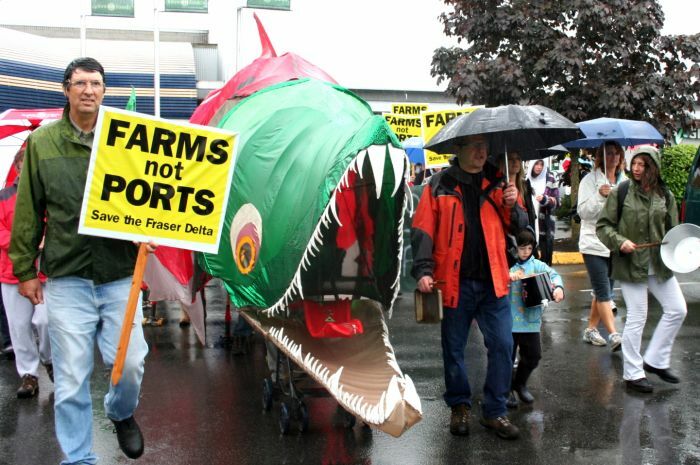 With a unique climate, long growing season and top-quality soil, the lands of the Fraser River delta are critical for the lower mainland’s food security. “You know what? 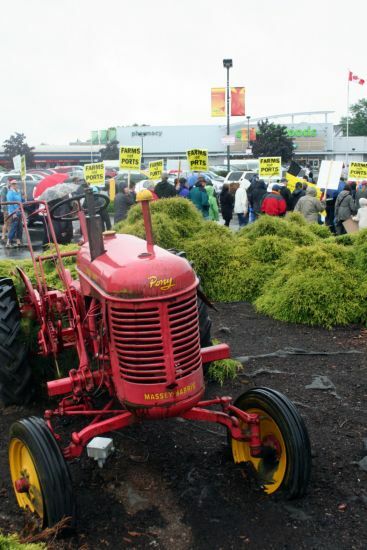 We can’t eat asphalt,” said Arzeena Hamir, a food security advocate and one of the main organizers behind the City of Richmond’s ban on Genetically-Modified Organisms (GMOs). 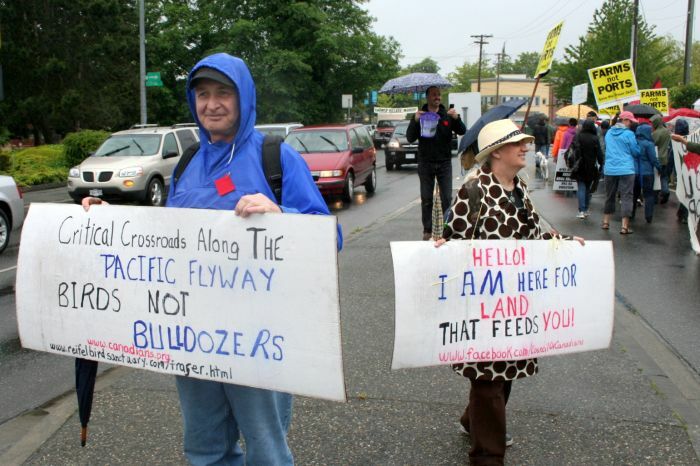 The fight against the Deltaport expansion is also part of the global struggle against climate change, said Wilderness Committee Pacific coast campaigner Tria Donaldson. The coal exporting facilities at Robert’s Bank make Deltaport the biggest coal port in North America, shipping 21 million tons of coal a year to Asia. The current expansion proposal would double those numbers, said Donaldson. 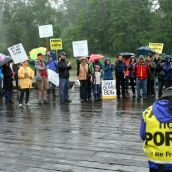 But the local fishing communities in Ladner, throughout the Fraser River delta region and upriver have also suffered the impacts of the Robert's Bank Superport, initially opened in 1970. 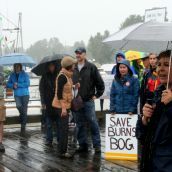 In what was perhaps the most passionate speech of the day, local fisherman John Stevens told rally participants about the resistance of the fishing industry to the port. “Right now the laws of the land are against us. But I say to hell with all that. We have to challenge the laws,” he said. 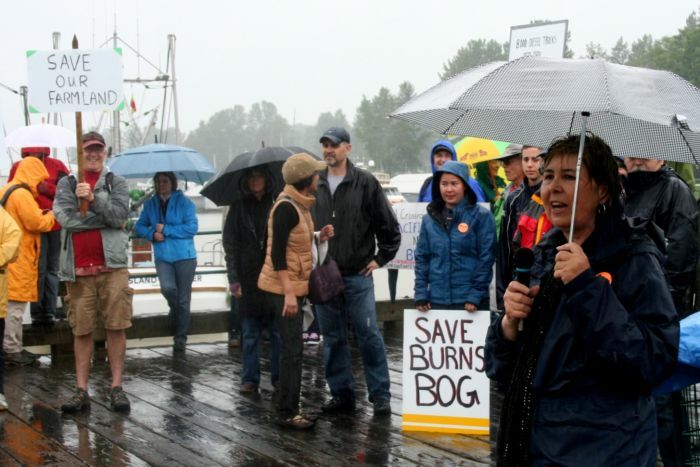 Stevens spoke of the local fishing industry’s opposition to the port and to the proposed expansion plans over the years. 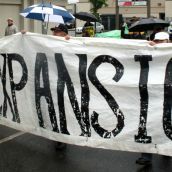 He pointed to people’s movements in Quebec, Greece and South America marching in the streets en masse as the necessary path forward to re-gaining control of lands and resources from corporations. 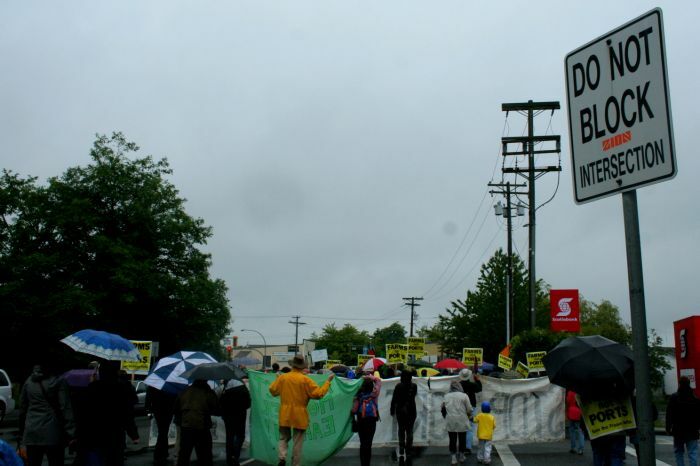 With chants and banners representing the different reasons why people are increasingly opposed to the expansion of Deltaport and the industrialization of the region, people marched through the streets of Ladner to the bank of the Fraser River. 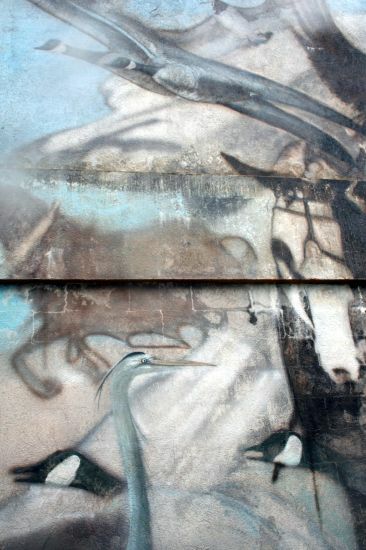 As the rain continued to pour down, two swans swam past the fishing boats docked in the river. 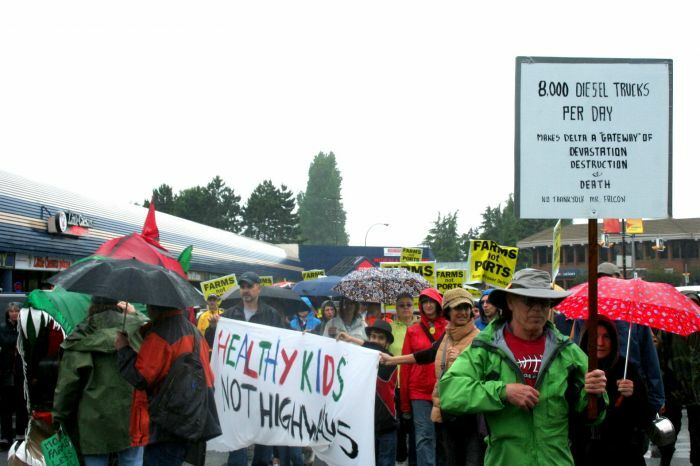 This was the first demonstration against port expansion in the area, said organizers. But it won’t be the last. 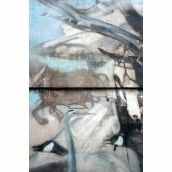 Sandra Cuffe is a Vancouver-based freelance journalist and regular contributor to the Vancouver Media Co-op. Thanks for doing this Sandra!